Okay, I’ve made you all wait long enough. I’d like to say I took so long to allow some time for self-reflection, to see what the after-effects were so I could pass that on too or some other made-up reason. The real truth is that I started writing it the week after the race but I procrastinated because it seemed like a fairly daunting task and then other things just got in the way. While I didn’t do a lot of training hours (relatively speaking) there were a lot of things I put off because recovery was a priority and so it was time to get a few of those out of the way. 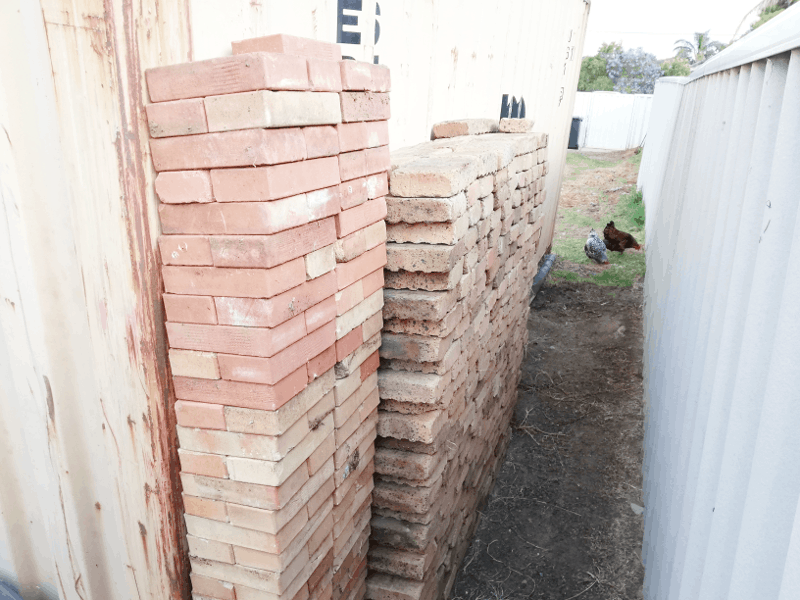 For instance, the Saturday after Ironman I moved these bricks out of a pile of overgrown grass and stacked them ten metres away, two by two. It wasn’t pleasant and the hamstrings complained just a little. So, here it is. I warn you though, it may take you almost as long to get through as it took me to do the race so I’d highly recommend getting yourself a pot of tea and a packet of biscuits (Tim Tams are recommended) before you go further. If it’s afternoon for you then a bottle of wine or a six-pack of something cold might be a better option. Hopefully I can give you some idea of just what this experience was like for me and countless others on the day. Enjoy. I always suggest that the night before the night before a big race is the one you want to make sure you sleep well, because often the nerves and excitement will prevent you from getting decent rest on race eve. I don’t know what happened to me though, because I slept like a baby. That’s right, I woke up hourly crying and soiling myself. Okay, so let’s say I slept like a log from the time I went to bed until the allotted waking hour of 4:30am. Now I’m not one to rush things…anything, but I had a decent number of things to tape to my bike and prepare in transition before the race start so I hoped to get down there by around 5:30 at the latest as transition closed at six. I don’t generally have a lot to do before I go anyway as I’ve made everything ready the night before so it’s just a case of getting dressed, coffee, toileting, race tattoos and having my four slices of white toast with honey. This is the first big race that Simone and I have done together so I wasn’t particularly familiar with her routine. So, we get to transition around five-forty, barely enough time to strap my gels and caffeine tablets to my bike in between spraying my wit at everyone around me that was looking nervous or worried that they were forgetting something critical. Honestly, I think I can probably be a bit of a pain in the arse to those that are in panic mode in the hour or so before a race. I imagine they probably think I’m over-confident or not taking it seriously but neither of those is true, for me it’s about perspective. The outcome of the day won’t be decided by those few moments, rather the weeks of training (or not) and the key moments as the day unfolds. Being flustered or expending nervous energy can only have a negative effect and ultimately where I finish on the first-to-last spectrum or even if I DNF (the dreaded did not finish) it doesn’t change who I am, in my eyes or anyone else’s. I think this is my favourite part of Ironman. Standing on the beach with hundreds of other individuals, dressed head-to-toe in rubber and wondering what the day will bring. Certainly, one thing it had brought to us on this day was fantastic swim conditions; something I was glad of because the new swim course was more prone to be affected by swell or chop than the old one around the jetty. 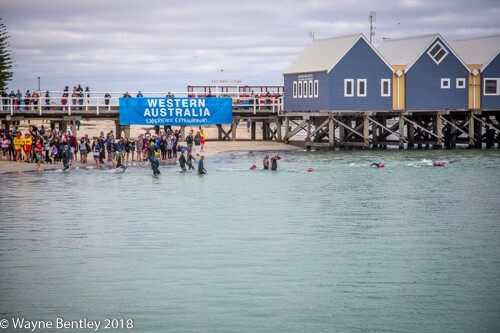 I was really disappointed that they changed the swim as there is nothing like a mass swim start with two thousand people all heading off at the same time and the trip around the Busselton Jetty was the one thing that really made the race unique. Simone and I got into our wetsuits up on the path in front of The Goose and wandered down the steps to join the throng. With a rolling swim start you locate yourself in groups according to your expected swim time (or in many instances just where you think will give you the best outcome.) With Simone expecting to be out of the water somewhere after one hour forty minutes and my predicted time between 1:15 and 1:20 it was there that we had to part ways, kissing and wishing each other good luck. I wandered into the crowd looking for familiar faces and ended up finding a lot of them, including my mate Sam doing his first after such a long build-up to get to that point. I also had Justin, Oleg and Monica from the club all in close proximity as well as a new mate Kieran from Karratha. Monica had come off her bike and done a bit of damage to her shoulder two weeks before the race, she was lining up not knowing whether she would be able to make it through the swim. I had faith because I’ve seen how tough she is but I also know it’s a very long way to go with something like that. We funneled our way towards the arch where three-by-three we would cross the timing matt and be sent on our way. Pete Murray, the Ironman Oceania chief race commentator was there near the start on the microphone and as he had done a video about six months ago to tell Sam that his friends had organised an Ironman entry for him (what kind of a friend does that?) I had to tell him that here he was, the 41 year old iron-virgin, which he repeated over the speakers wishing him luck. Kieran, Sam and I were set off together and as Sam had suggested he wanted to hold my feet (draft off me) we sauntered down to the water before grinning like idiots at each other and setting off. He was still with me at the first turn buoy before we headed under the jetty but that was the last I saw of him on the swim. The whole swim was fairly uneventful other than a couple of times where I gagged and thought I was going to chuck from a mixture of snot and salt water in the back of my throat. Soon enough the two laps were ticked off and I took a right turn to head to the shore. I stood up in one hour and twelve minutes with the watch reading slightly over 4km which I was quite happy with, even though I didn’t think I’d swum that wonky. Later I learned that everyone had recorded the swim as long. My all-time Ironman swim PB (personal best) is only 1:08 and in conditions equal or better than this so given that I’d only swam a grand total of 40km since June (38 of that in these ten weeks) it was a win for focused training. On the beach as I headed up towards the showers (yes, there are showers at the exit to wash the salt off) I saw mum and dad so I stopped to have a chat to them for a minute. Not that there was much to talk about but any excuse to hear my own voice is a good one. After that I climbed the stairs over the run course and walked my way to T1, passing best friend Bianca who I tried to have a conversation with also but she would have none of it, grabbing my head and smacking a kiss on the cheek before telling me to bugger off to the tent. Nobody really cares about T1, I mean it’s basically just about how fast you can get your wetsuit off anyway so I took my time as usual. 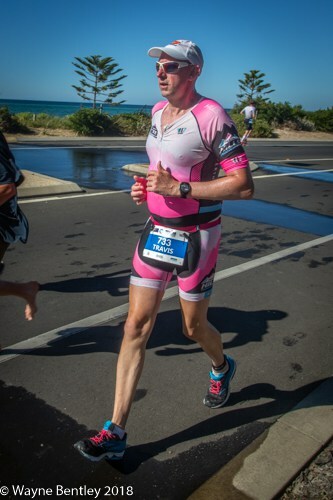 Seriously though, in Ironman you’re going to be out on the bike for a long time and you can’t easily do too much without stopping, unlike the run leg, so it’s important to make sure that you get this right. Sunscreen is really important and I always recommend putting on socks as you need them for the run anyway and it just makes the ride slightly more comfortable. My mate Peter was volunteering in transition so we had a bit of banter and he refused to apply more chamois cream (he was busy attending to a fully naked Japanese man anyway) before I turned to head off to the bike. As I did I saw Sam again on the other side of the tent so I went over and gave him a pat on the back and asked him how he went. He was like a well-proportioned child in a lolly shop, the grin went all the way around to the back of his head. Even though I do T1 with style in mind rather than speed I always like to mount my bike like a racer. Once I hit the mount line it’s one…two scoots and then I get my leg over (always difficult at my age, limited flexibility and with a substantial inseam.) Running in socks and getting your shoes on while moving at thirty kay an hour is always going to be significantly faster and it’s really not very hard to learn. Sometimes I’ve gone a kilometre before I’m fully in but riding with your feet on top of the shoes rather than in them is no different to riding flat pedals like most of us learnt when we first got a bike as a kid. 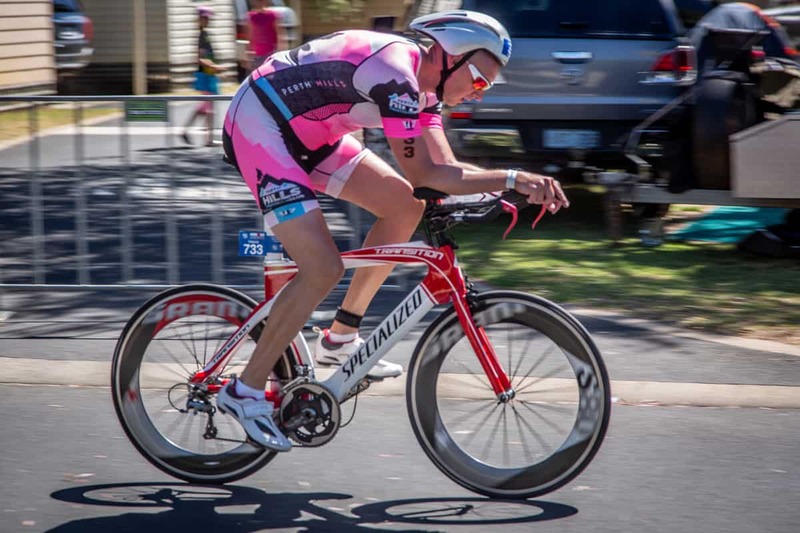 The Busselton bike course is sold to the punters as being “flat and fast” which it certainly can be (fast that is) but while the lack of uphills might have many people cheering the inability to get any rest on a down-slope can make this leg relentless. Stop pedaling for even a moment out here and you’re your speed starts to drop, something which posed a bit of an issue for me later on as you will see. I saw a lot of people I knew out on the bike as the course has five dead turns so you only have to be within six or seven kay to catch pass them going in the opposite direction at some point, either ahead or behind you. One really sticks in my mind though and that was when I saw Monica, I’m pretty sure I let out rather large yell of joy and it gave me a little turbo boost knowing that she had made it through the swim. My second great moment on the bike was as I was getting close to turn back on to Tuart Drive when I saw my love coming back the other way. Well, she saw me first really (I am a much bigger target and easier to pick out from the crowd after all) and we asked each other how we were going. She seemed happy and riding comfortably, a quick check of my watch and an estimation of how far behind me she got into the water told me that she was well ahead of her target. In hindsight I think I was wrong and she was actually sitting around where she wanted to be but my miscalculation made me happy. The first lap of the course is always pretty good. The wind is pretty mild at that time of the morning, there are lots of people to pass or be passed by, the road is smooth as butter and it’s only ninety kilometres. The second lap on the other hand has a massive headwind any way you turn, is lonesome and they’ve covered the road with large pebbles, or at least that’s what your backside says. Today was no exception. Turning around back in Busselton is fantastic, well the being there bit is. Actually heading out knowing you have to do it all again can be a real downer. At this stage I had been following my nutrition plan nicely with two gels every hour and just water to drink. In order to do this I had been getting two gels at each aid station which took a little coordination as the volunteers normally only had one so I had to call and grab from two in quick succession. On the one in Busselton this proved a little more difficult and I dropped the second gel. Knowing what a hole something as simple as missing 30g of carbohydrate can leave you in I decided to stop the bike and retrieve it. The vollie apologised profusely and picked it up for me, I told her I was glad as it gave me a chance to get my bum up off the seat and then off I went. So, by this time I had been needing a wee for, well, since I jumped on the bike really and it was starting to get a bit painful to be honest. Public urination is a disqualifiable offence so stopping on the side of the road is not an option and toilets are only at aid stations, the next one being at least forty minutes away. 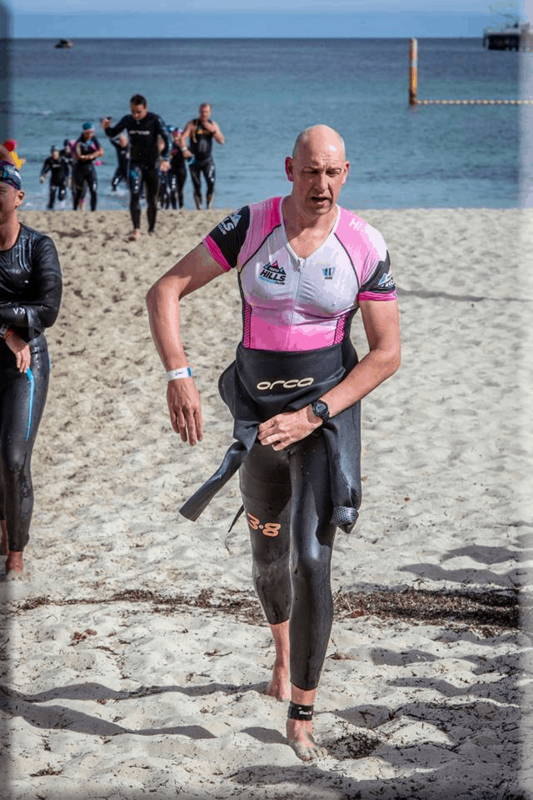 It’s one of the rights of passage for an Ironman to wee while riding on your bike but it’s not easy to do, especially when you have a shy bladder! Truth be told I had actually been trying to do it for most of the second half of the first lap without success and now things were getting desperate. The problem is that it is very difficult to wee while your legs are moving and you don’t want to go all over your saddle and spares so you have to stand up and stop pedalling. Did I mention the issues with a flat course? Stand, coast…almost relaxed enough…here it comes…oh bugger, need to pedal again or else I’ll fall off. Stand, coast…almost relaxed enough…here it comes…oh bugger, need to pedal again or else I’ll fall off. This went on for about fifteen minutes before I finally found relief. Mostly avoided my shoes too which is always a bonus when you aren’t changing your socks before the run. A squirt with the water bottle and we’re good to go again. Oh, and if there are any TO’s (Technical Officials) reading this whole paragraph is a fiction and never really happened. As I went around a turn-around point on the second lap I saw Sam perhaps a hundred or so metres behind me. Being a better rider than me I expected him to pass me not long after but at the next dead turn twenty kilometres later he was still at the same distance. He must be the worst drafter ever I thought. At the next one I yelled at him to ride like he meant it and pass me and I thought he was going to but he just pulled alongside for a little chat. Apparently he thought with my experience I knew a thing or two about pacing so he was using me as a guide, foolish lad. To do him a favour I stopped off at the penalty tent to see Slim who was looking a little bored. I hadn’t received a penalty but on the way out past him I’d asked him to give me Simone’s last recorded split so that I could check that she was doing okay. Of course she was and once Sam had gone past I carried on. The rest of the ride was pretty uneventful. There was a guy out in the forest that was drinking a beer on the other side of the road so I shouted at him that I’d grab one on the way back. When I did come by again five minutes later he was incredulous that I might actually be serious and when he realised I was it was too late. I guess I was going to have to wait until the run for my first beverage of the day. Oh well, it was only another half hour. A great mate of mine, let’s call him Ratty because everyone does, is a superstar of the bike-to-run transition. His theory is that even if everything else is falling apart you can still salvage some pride with a great T2. Now I’m not half the man he is (actually now he’s lost a bit of weight I probably am, maybe three quarters at a stretch) but he’s instilled that ethos in me and if I could run I’d probably be a fair match for him in this department. At present though he’s recovering from a knee operation so before the race he gave me a few tips to speed me through. Sadly though I had pretty much worked it all out myself anyway and unless he was keeping some to himself I have a couple more as well. The first rule of a quick T2 is know your timing mat. A few extra seconds on your bike time is practically meaningless so you can do some prep work before you hit the line, like stretching and getting a run-up. Unfortunately on this occasion when I was asking the volunteers at the bike dismount where the mark was I heard a beeeep, signalling that I’d just stepped on it. Oh crap! 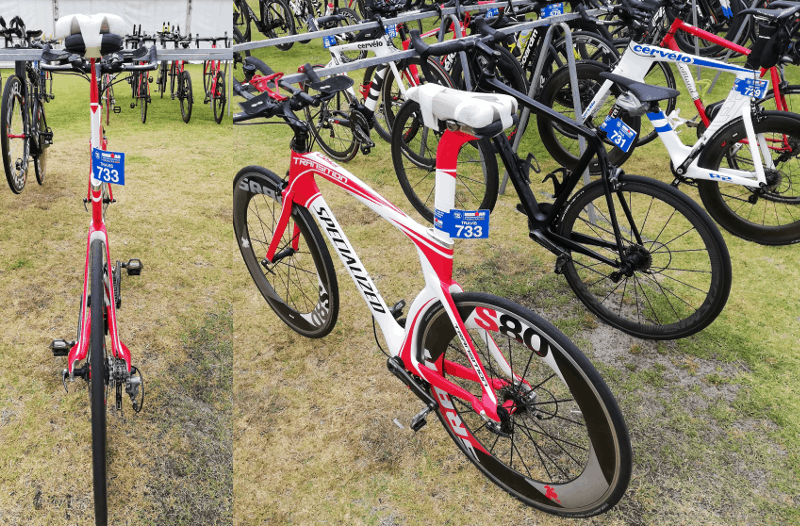 I should apologise to the bike catcher (they take your bike from you and put it back on the rack in Ironman) as I just let my bike go before I passed him while I sprinted. Ironman WA is one of the worst T2s possible for me as you need to run the best part of 200m (via the tent.) Once in the tent it’s just shoes out of the bag and straight on your feet, grab the race belt and hat then run leaving your helmet with the bag. This year I got third place in T2 overall, second male and first in my age group. The guy that won it did something like a 1:12 compared to my 1:31. He can obviously run quickly because there was no fat to trim from my time in the tent. I might need to work on my sprint technique this year. Let’s not call it a run leg. There was very, very little running done by me. This was always going to be the case with the lead-in and, if I’m totally honest, knowing that I probably gave myself permission to walk a lot more than I really needed to. All that mattered with this one was the finish though, so walking was fine by me if that’s all I had to give. Early on the run I caught up with Ineke from Triathlon WA who was on the second lap. It was her first Ironman and she was looking as glamourous as ever, though not feeling it. As we walked together briefly she told me that she had been doing a lot of groundwork to make sure that Pete Murray would pronounce her name correctly when he said the words we all hear at the finish. “<Insert name here>, you are an Ironman!” I later heard that one of the other commentators was on when she crossed so they tried but failed miserably. About two kilometres into the run I had Sam come past me and slap me on the arse. I’m not sure if I’d told him that’s what I asked people I knew to do to me, perhaps it was his own special touch. In any event we had a brief chat and I wished him well as he went on ahead. Ten seconds later I realise that I really wanted him to have the full Ironman experience so I sprinted past him and slapped him before stopping for a rest as he jogged off into the distance. As much as I dislike running, or perhaps it’s more a case of it disliking me, the marathon is probably my best leg of an Ironman. I guess that’s because it plays to my greatest strength…talking. As much as people might believe otherwise I can’t talk underwater and when you’re cycling your encounters with others are far too brief for anything more than a few shouted words. With my pace and that of those around me in the back half of the run though, life stories can be shared. At various stages I think I caught pretty much everyone from the club and most others that I already knew out there. Some, like Monica, I spent a bit of time with while others it was just a brief chat as they ran past in one direction or the other. I won’t lie, I probably sledge and joke far more than a man of my modest athletic ability should but I think everyone takes it with the good humour it’s intended. One of the great moments was seeing clubmate Bill on the sidelines and having him tell me that he had won his age group comfortably and would now be living his dream of going to Kona. There was one guy I spent a fair amount of time with over the course of the run leg, his name was Nick and he, like me, had his partner on course somewhere behind him. I wouldn’t say that he could out-talk me but I reckon he it was a fairly even match. I think we might have walked the best part of two laps either side-by-side or within a dozen or so metres of each other and regaled each other with tales of Ironman glory (and failure) from our respective histories as well as solving most of society’s woes. It’s amazing what you can do with a lot of time and lots of oxygen. Early on the last lap his wife came past and he felt obligated to stick with her for the sake of domestic bliss. Well that was his story at the time but I did see when I checked the results that he crossed the finish line two seconds ahead of her so I suspect it was more about bragging rights. Until you’ve competed, and struggled through, a longer race I don’t think you can truly appreciate the value of a support crew on the sidelines and I might be biased but I think the Perth Hills cheer squad are one of the best going around. Every time I passed the club tent I was spotted early (okay, this may be more due to my appearance than their diligence) and the banter came from all quarters. There aren’t too many clubs with multiple members willing to flash you to try and raise your spirits. A huge thanks to all of you for your efforts, especially those that stuck around to see the last of the wolf pack finish (me.) Just one thing though, next time you put the club tent up make sure that the club logos are facing in the same direction as the course! Just a hundred metres or so after I collected my last wrist band (you get one after each lap you complete) I heard a call from behind me that I recognised. She had been gaining ground on me for some time and now Simone had caught up, albeit a lap behind me. I don’t know if it showed on my face but that last kilometre was probably the best part of my day. Having the opportunity to speak with her properly and find out how she was feeling, how her back was holding up and what she had been up to for the last fourteen and a half hours was absolutely priceless to me. Had she asked me to I would have gladly done the last lap again with her (according to my Garmin file I had already done an extra kilometre on the run course from crossing over to the other side of the course to see people I knew) but she would have none of it. Truth be told I probably would’ve just ended up annoying her so she left me at the start of the finisher chute with a kiss and headed back out in the dark. Ahead of me where the path turned to head past the stands and main part of the finish there was a gent from Thailand hugging a family member and collecting a flag with which to run across the line. It was obviously a very proud moment for him and one I thought he should have to himself. I was in no desperate hurry and the security bloke standing there seemed like a decent bloke so I stopped and asked him how his day had been and if he had any beer on him. He didn’t and by this time Suk had cleared the finish so I checked that there was nobody else immediately behind me before setting off. I don’t know if I’ve mentioned it before but I have a personal policy that if you can’t actually be good at something that you’re doing then looking good is the next best thing. Lots of Ironmanners (not a real word) spend many, many hours out on the run course just like I did and then get to the finish chute and it’s the fastest fifty metres they’ve run all day. If you’re in line to set a new personal record or beat a significant time (e.g. go under X hours) then I’d highly recommend that approach. In all other instances might I suggest that you take your time, thank any friends and family you can find for supporting you all day, and enjoy the rockstar experience. The medal went around the neck (unfortunately for the poor volunteer “catcher” I couldn’t bend over much so it was a bit of a struggle) and the finishers towel was handed to me with the usual queries as to how I was going. I saw mum and dad to my left so I walked over to them to thank them and let them know that I was okay and roughly how long I though Simone would be before I left for the recovery tent. The recovery area is fantastic, it’s one area where they rarely skimp. Lots of tables and chairs with other finishers around to share stories with; staff to make sure you’re okay and get you anything you want if you can’t do it yourself; hot savoury food (a godsend after eating sugar for fifteen hours); medical personnel if you need them; most importantly though, it also contains the massage area. Yes, that’s right, you get a free* massage included in your $800+ entry fee assuming you finish. I understand that all of the masseuses are volunteer physiotherapy students and even at ten o’clock at night they are all happy and smiling. I guess they don’t know what some of the athletes have left on the parts of their bodies that they have to touch. In my instance the two guys doing my massage were also providing entertainment as I listened to their attempts at flirting with two of their colleagues. After I got off the table, collected my street gear bag containing my phone and had had some hot food all I could do was wait. Unfortunately, something was wrong with my phone preventing me from typing, so I couldn’t get updates as Simone passed the timing mats out on course to give me an idea of when she’d be finished. Luckily, I met Steve (one of the TO’s, a TWA board member and friend) and he looked up her projected finish time for me. With less than five kilometres to go she had a little over an hour to finish under cut-off so barring a disaster she was home-and-hosed. 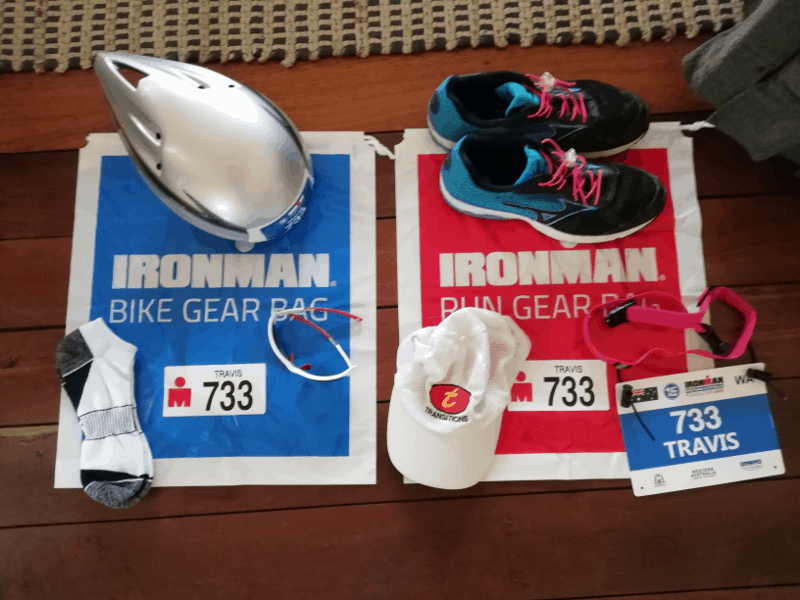 She has finished two of these monsters before in 2013 and 2014, the first just a few months after I first met her at Mandurah Half Ironman, but I knew that both times she had received the wrong size finisher shirts. One about four sizes too large and one two too small. I wandered over to the shirt collection area to get mine and made sure that they still had her size left. Plenty as it turned out but it was a little fist-pump moment for me. Once I received word that she had passed over the timing mat with one kilometre to go I made my way out to the back of the finishers’ chute. I’m not entirely sure if I was supposed to be allowed to go there but at that time of night I don’t think anyone cared and I just started friendly conversation with anyone who looked like they might question me. The run course goes past the finishers chute before doing a u-turn and I spotted her as she shuffled with about two hundred metres to go. I’d been keeping an eye out to ensure that there was nobody in front of her and I asked Pete (the commentator) if I could present her medal and towel to her. I didn’t think she’d mind, luckily I was right. As she crossed the finish line and had her name called she saw that it was me waiting. There were tears of happiness. She may have cried too, I’m not sure, and I escorted her to the recovery area after she spoke to my parents and just about cut the next finisher off. Her time was 16:49:39; the pacing was impeccable, leaving enough time to allow for something to go wrong but not using more energy than she had to. She even had a faster run split than me! Waking up after about six hours sleep it’s always a bit of a lottery as to whether you can firstly get out of bed and secondly walk to the toilet and/or fridge. Remarkably, other than the usual sore feet from walking so much I was feeling pretty good. All of the joints seemed to be functioning as intended, if a little bit creaky, and so coffee was made to ensure that nobody had to die. There were two important things to do today; the first was to go and watch the Kona roll-down where the best and brightest get an opportunity to spend a thousand U.S. dollars for the opportunity to compete in Hawaii (costing further several thousand in travel and accommodation, hey Bill? ); the second, and undoubtedly most important was the Beer Mile. The race itself consists of four four-hundred metre intervals, each preceded by the consumption of a can of full-strength, fizzy alcoholic beverage (preferably beer.) Should one chunder during the event a fifth can must be imbibed in order to be deemed an official finisher. Fancy dress is encouraged, the more appalling the better, and at the end of the day everyone is a winner, including the actual winner. So, when I started this the aim was to show that Ironman wasn’t really as difficult as what a lot of people think. That even after a long layoff (nine months) it was doable for an average (or below average) middle-aged person without any significant pre-existing injuries and a bit of common sense. Hopefully I have proved that to a few that have been patient enough to read along but the truth is that I’m not really the big story, and nor should I be. If you want to see just what can be done, I would direct you to take a look at Simone before me. She decided to take on this challenge on the same day I did, but her time away from competing or any significant training has been around four years. She works a physical job as a porter (orderly) doing long hours of shift-work at the Fiona Stanley Hospital emergency department. She also has chronic back problems (basically missing a disc) for which she is taking daily pain medication and really needs to have surgery. With all of these challenges she managed to come in under cut-off with a smile on her face and enjoying the whole day. That’s pretty special. If she can do it with all of that going on, what makes you think you couldn’t? You might just surprise yourself. I’m not really sure that I’ve ever done what would traditionally be called a proper taper. For me personally I generally just do a little bit of everything with the aim to get fully recovered but not stale and sluggish. I think sometimes people can pretend that it’s a little more scientific than it really is, it’s so individual not only for each person but for each race. After Sunday’s race the rest day on Monday went down a treat, the legs were a bit sore and I needed some time to get the gear clean and dry ready for the weekend. My parents were away in Busselton waiting for our arrival so Tuesday I had Leila when normally they would have. This meant taking her to tennis so while she practiced I hit the trails of Darlington for a forty-five minute trail run and the legs felt surprisingly good. Wednesday evening I was coaching swimming so I got to the pool a bit early to do a session myself. As I arrive club coach candidate Emma was just leaving and she wanted an opinion on her wetsuit fit so we chatted for a good fifteen or twenty minutes which resulted in me being left with thirty minutes for my two and a bit kilometre swim set. Knowing that this was beyond my capabilities I thought I would take the opportunity to slip in a little test session to see if I’d made any improvement over the last ten weeks. The swim test that I prefer is known as a critical swim speed (CSS) test. It consists of a 400m and 200m all-out time trial with rest in between. The shorter time is then subtracted from the longer and divided by two to give a CSS pace per 100m, the result often very similar to that of a 1000m time trial but without the pain, or at least for a shorter time. This is then used in a similar way to what threshold pace is for run sessions or threshold power for the bike, to set training and racing targets. The last time I performed the test was back in week one of this little adventure and the results weren’t awful with a 6:55 and 3:17 giving me a CSS of 1:49/100m. Given that I’d only swam fourteen times since then I wasn’t expecting great things but the end result was a 6:19 and 2:59 (I think only the second time I’ve broken 3:00) for a CSS pace of 1:40. I think at my absolute best I only tested at 1:36 so I’m certainly not going to complain! Before big races (Ironman and half-ironman if I’ve trained a bit) I can sometimes feel like a bit of a fraud. I see all of the hard work and dedication of “real” triathletes and the stress they seem to be under worrying about the outcome and I just don’t have the same drive. One thing I’ve always believed though is that you can fake it until you make it. Sometimes just acting the part you want to play gets you into the mindset to become what you want, for example it’s hard to feel crappy when you force a smile for long enough. So how do I fake being a triathlete? I do the thing I swore I’d never do when I took up this sport almost ten years ago. I go hairless. I don’t mean on my head, that’s the normal state anyway, it’s the legs that get the treatment. Mostly I just shave them but this time Tarn very kindly offered her services in giving them a wax. Even with the forest-like growth that I’d accumulated I can assure you it doesn’t hurt very much and no matter how stupid it seems it just makes me feel like I belong. The plan was to leave home around midday on Thursday but with the wax in the morning and a few other things to do packing didn’t start until around 11:30 so we didn’t pull out of the driveway until around one. Simone insisted on driving (because I drive like a grandpa apparently) and we had a few issues with the bike rack on the back of the ute which resulted in us arriving at Busselton just after four. I normally register on the Friday because I don’t particularly care for sleeping with the wrist band but Simone gets a little excited where Ironman is concerned so once we’d parked up and put the bikes inside the house it was down to the expo to pick up our packs and do a tour of the stands. Nothing of significance was bought but there were certainly a few items put on the “considering” list. The big race weekends are always very busy for me. I tend to take an hour to get anywhere because the place is full of people I know and even though I’m very shy (as I’m sure you’ve noticed) I can’t avoid them and have to stop to let them listen to me for a bit. I love it really but sometimes it would be nice just to be able to sneak around unnoticed and relax by myself. I certainly wouldn’t say I’m an introvert but sometimes you don’t feel like company. Thursday night was a catch-up with my parents who are staying, as they do every year, in their caravan at a park just up the road. Club mate Shane and his two gorgeous daughters joined us for a roast dinner that really hit the spot. Friday afternoon Simone and I caught up with a mate, Sam, who you have heard about before. It’s going to be awesome to see him do his first Ironman tomorrow and he really seemed in a great headspace for it. A huge transformation from just a few weeks ago and one he should be very proud of. Then we were off to the Vasse for dinner and to catch up with the Perth Hills crew down here to race the full or half ironman or just as importantly offer support. It’s a great club and one I’m very proud to lead. Saturday morning was the regular pilgrimage to what I consider to be the premier event of the weekend, Ironkids. Watching them race is just brilliant as they couldn’t care less about times or anything other than getting to the finish line and getting their medal. I think it’s something we should all probably try and capture in our own sporting lives. It’s funny too watching all the dads and mums who are doing the half or full the next day having so much more joy and pride in their kids race than they ever will in their own. That afternoon Simone and I went to The Goose to meet a good friend Pete and his better half for a beer, it’s kind of a tradition for him and I pre-race. To my immense surprise my closest friend showed up too and I had absolutely no idea she was going to be here at all. In fact I very nearly sent her a message earlier in the day to give her curry about not wishing me luck or coming to cheer me on! Well there’s not a lot to tell here. A couple of open water swims and a shortish ride on the bike to check that there were no issues are all that’s been done. Unfortunately there’s been too little use of sunscreen and I now have a slightly red glow about me but it’s too late to do anything about it. Saturday after the last ride the spares, stickers and other final touches went on to the bike. The bike and run bags were packed, along with the stuff I need to take into transition on race morning. The bike has now been racked, the bags put in place and a brief walkthrough of transition done in readiness for the morning. As Doris Day sang, whatever will be, will be. There is nothing more that I can do other than get a decent night’s sleep and wake up ready to swim, ride and run for the best part of a day. If you want to get some context of what this is that we are all embarking on imagine jumping into the Swan River at the Causeway bridge then swimming to the Narrows. 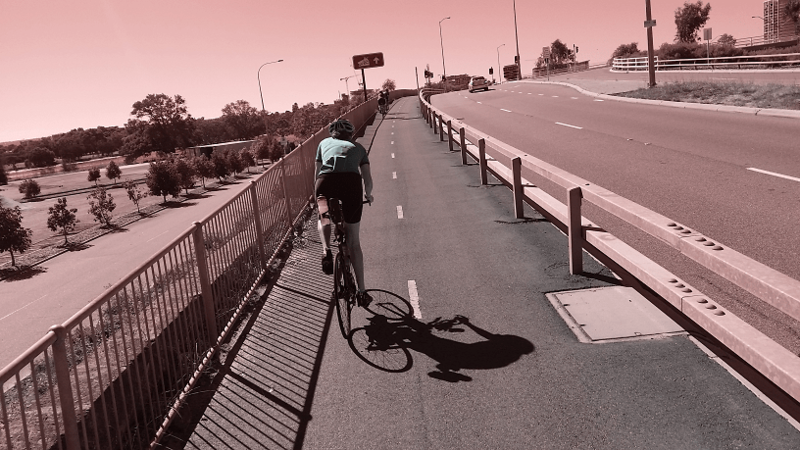 Now get out and ride your bike down to Bunbury for a bit of fun. Once you’re there, throw some runners on and jog your way to Busselton. That is roughly the equivalent of what Ironman involves. Eight years ago I thought anyone who would even consider something like this, let alone do it, must be super-human. Now as I’m about to embark on my ninth I want you to know that whoever you are reading this, it’s not beyond you. Maybe you’ll need more than ten weeks of training to get there but with determination and a sensible approach it’s yours if you want it.